We've heard it from teachers all over the country: new state assessments, including PARCC, Smarter Balanced, and ACT Aspire, require more from students than just math content knowledge. 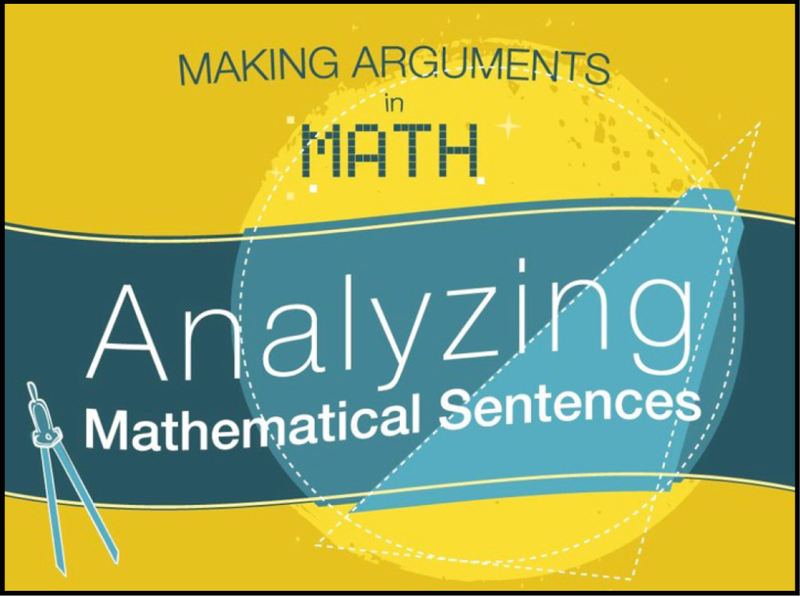 They ask students to write mathematical arguments, cite evidence, and explain their reasoning. This is all part of a national shift in education towards developing students' critical thinking skills. Fortunately, that's our specialty! 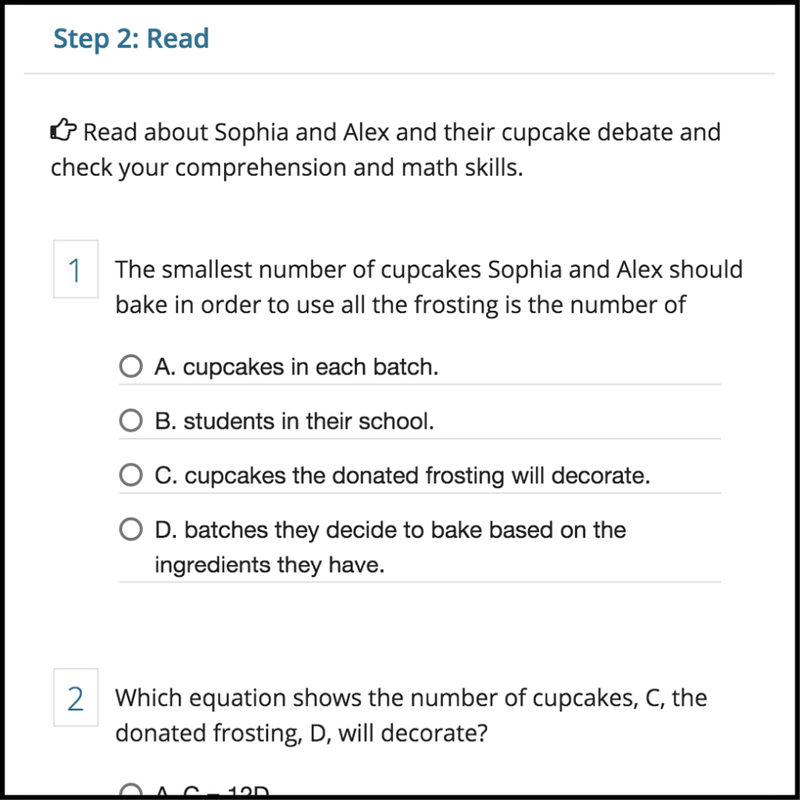 To help students feel confident and prepared for these assessments, you may have heard we added new math literacy lessons to our platform. 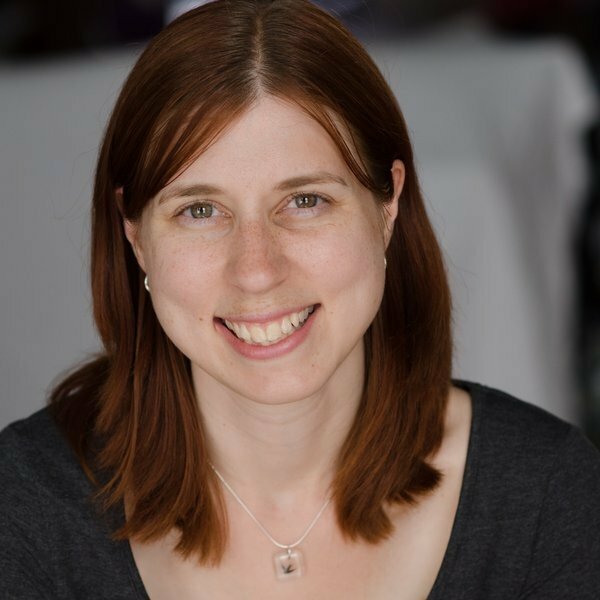 These lessons are designed to support the expansion of mathematical knowledge through its application in writing. Businesses: How do businesses make money? Cooking: Why is math important to cooking? All of our math lessons start off with a real-world scenario. Not only does this help students connect classroom life to everyday life, it mirrors the kinds of questioning they will see on new assessments. TOP: ThinkCERCA grade 6 example from the Cooking math set; BOTTOM: ACT Aspire grade 6 math example. 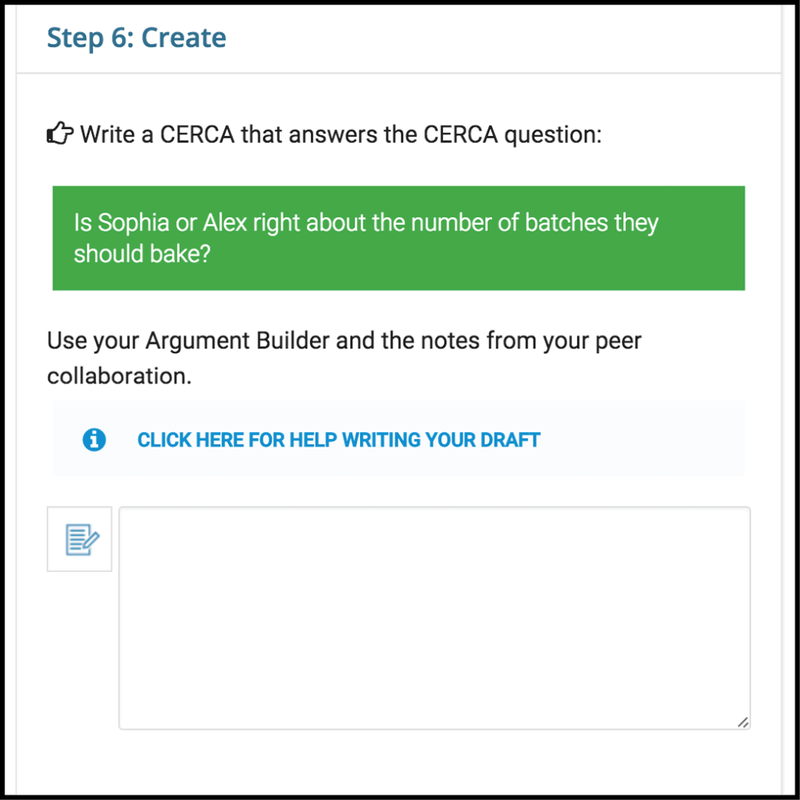 After reading through the problem, ThinkCERCA provides students with opportunities to answer text-based multiple-choice questions about the problem or scenario before moving on to their own writing. These questions cover both math content and math practice standards. Multiple choice questions featured within the grade 6 Cupcake Debate math lesson. 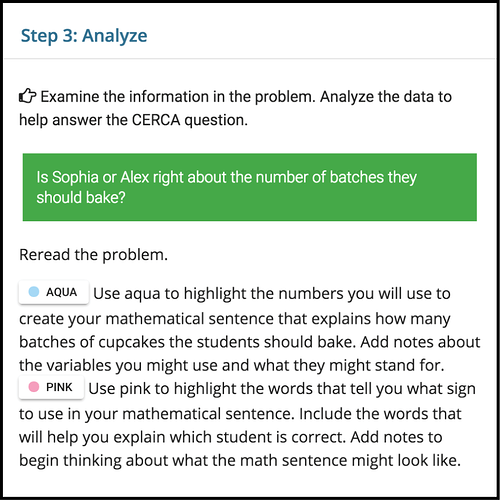 ThinkCERCA's math lessons also end with a constructed response, similar to new assessments, in which math content knowledge and math practice skills come together. Students demonstrate their ability to both do math and explain their thinking. 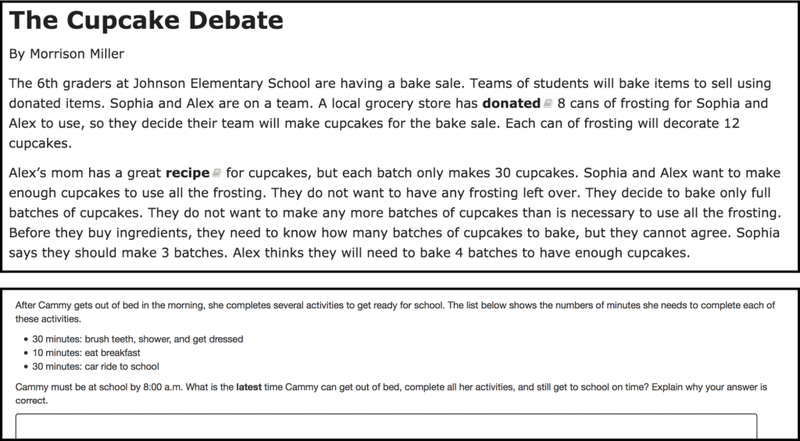 Writing prompt featured within the Cupcake Debate math lesson for grade 6. Example grade 6 math questioning from ACT Aspire. Instructions for analyzing the data presented in the math problem. A graphic organizer to help students organize their evidence and reasoning. ThinkCERCA also provides multimedia Minilessons to introduce or provide refreshers for students on foundational math practice concepts like Math Arguments and Analyzing Math Sentences. ThinkCERCA math Minilesson for teaching students about key skills and concepts through direct instruction. And as with all ThinkCERCA content, these lessons are standards-aligned and differentiated to meet all of your students where they are.